Helmets: Bring one if you want one. There’s lots of bikes for rent, but nobody’s gonna give you a helmet with your ride. If you want one, bring your own. Most people ride without it seems, and there’s no big shame in that. All the same they’re pretty light, and better to have it and not need it… Just bring it. Lights: The closer you are to the equator, less the seasonal variations in daylight apply, twilight hits pretty early in the evening in Hawaii. There’s no chance you’re going to not be riding when night sets, so do yourself a favor and bring a couple ‘be seen’ lights, front and rear at the least. A bag and a tool: If you end up going out on a bike, you’re going to want to bring something back. Do yourself a favor and avoid the ‘plastic shopping bag caught in the spokes’ look – bring a bag. You and your groceries will be happier for it. Note – I could not find a rental place that provided the ultra-cool and incredibly handy surfboard carrier. Bummer. There’s a business there somewhere, along with renting tandems! While you’re at it, stick your multi-tool in your bag. If you’re renting a bike, it’s gonna need some on-the-fly fitting and adjustment. A simple hex-wrench set would probably do fine, and if you have a multi-tool that’d be great. Getting a bike to ride: Airlines are charging for every last thing these days, so it may make more sense to rent a bike on the island than pay the $100-a-way fare to get your rig on the plane. Renting a bike in-situ isn’t a bad way to go. 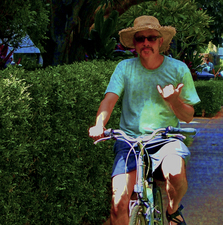 Bike rental spots abound in Honolulu, mostly for garden variety cruisers, which is what we rented. You can spend a bit more money and get a nicer mountain bike or a ‘performance’ road bike, but hell you’re on vacation! Take a ride on the slow side and stick with the cruiser, it’s better than you think (Ok, it was better than what I thought, and YMMV). A friend who’s a year round commuter was very surprised by how un-tank like the cruisers were. A tip For those of you with folders or travel bikes (like the Modal or my own fixie folder ). The airline says they’re gonna charge you the bike price even if it’s in luggage, but they often don’t. We were very lucky stay close to Diamond Head in Honolulu, a bit to the west of the tourist core. I managed to get in quite a few miles of urban riding, and I’m happy to say despite a thriving car culture and plenty of rush-hour-crush, the city seemed quite bike tolerant. Signed routes, bike lanes, dedicated locking spots. Also, a ‘no bikes on the side walk’ law, so be prepared to ride in traffic. A whole flock of us rode out the Kalanianaole highway one evening for some drinks on the beach, and back again later in the evening. Even on this busy road we had no real trouble from cars in the daylight hours or later in the evening. All in all we had a great trip, even without knowing the tips above, so don’t sweat it too much, it’s all on island-time after all.